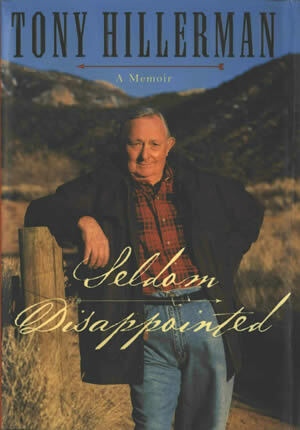 This is the first Canadian edition of Tony Hillerman's autobiography, Seldom Disappointed: A Memoir. It was published by HarperCollins Canada, Toronto, Ontario, Canada, in 2001. It differs from the US first edition mainly by price and ISBN number. This book is an autobiography of Hillerman's life from his childhood in Oklahoma to his career on the Bestseller's Lists. The front and back cover photos are credited to Kelly Campbell and feature images of Tony Hillerman himself. Binding: Quarter bound, royal blue boards with a red cloth spine and the title, author, and publisher printed in metallic gold on the spine.